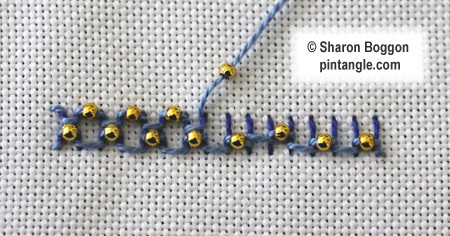 Beaded Lock stitch is a variation on double lock stitch. It is a very quick and easy to work beaded embroidery stitch, that looks good as a border or worked row upon row for a filling stitch. You need to be familiar with lock stitch to work this variety. The samples are worked in straight line but this stitch will hold a curve if you adjust the angle the foundation stitches in a ray or fan like manner. Note: With this stitch the beading is done during the lacing process using a size 26 tapestry needle as you can thread cotton perle #8 and #5 through the eye of this needle yet it is thin enough to thread a bead and add it to your stitching. Work a row of straight stitches of equal length. The lacing is worked from right to left. Bring your thread out on the right side of the first straight stitch. Pass the thread the needle under the first stitch from the left with the tip pointing right (as illustrated).Pull the needle under the straight stitch. Add a bead to your working thread. Move to the next straight stitch and pass the needle under from the left with the tip pointing towards the right. Pull the thread through. This will lace together the first two foundation stitches with a bead in the middle. Note that you are lacing the stitches and not going through the fabric. Continue in this manner along the line of foundation stitches. At the end of the line take your thread to the back of your work. 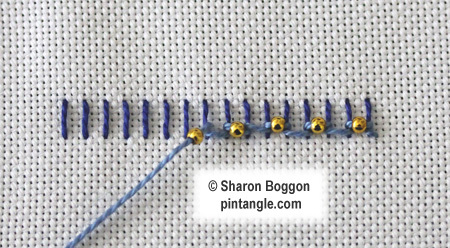 Work a second line of laced stitches adding beads in between every second foundation stitch as illustrated. On this top line you can offset the beads to create a stepped pattern or you can align the beads to form a vertical ridge. Both worked row upon row create a highly decorative and quick filling stitch. I got inspiration from others’ beautiful designs, then used your templates to draw some hearts and curves, and played around. Great fun! I like doing this stitch, here’s my sample. The Beaded Lock Stitch is one good lookin’ and inspiring piece of embroidery. Thank you. Thanks Sharon. I really like it with the thicker thread! I look forward to this stitch! Your examples are lovely! This week, I shared #129 – Lock Stitch. It was fun and I look forward to playing with it more in the future. I certainly enjoyed seeing the variety of ways others used it. Thanks for sharing it! Oh, lovely – can’t wait to do it.